Manchester United defeated Watford 2-1 in a close-run match at Vicarage Road on Saturday. Romelu Lukaku broke the stalemate while Chris Smalling added another goal three minutes later with an outrageous finish from a Marouane Fellaini assist. Jose Mourinho, the manager of the Red Devils, must be delighted to see such brilliant attacking football and character shown by his wards. Nemanja Matic, however, lowered spirits later in the game when he picked up a second yellow card and had to be sent off in the closing minutes. Smalling and Victor Lindelof were clinical at the heart of the defence too, allowing Antonio Valencia at right-back and Ashley Young (who came in for Luke Shaw) at left back to make forward runs. Fellaini often acted as the third centre-back and earned the praise of the highest order from Mourinho and television pundits after the game. In the press conference that followed the match, Mourinho said he was happy with all of his players as they are finally showing what makes them different. He also said that he loved the attitude displayed by most of the senior players. One player Jose Mourinho is indeed not happy with is Alexis Sanchez. After arriving from Arsenal in January in exchange for Henrikh Mkhitaryan, the Chilean attacker has failed to impress. Apart from one good game against eventual winners Manchester City at the Etihad stadium in late last season, Sanchez has little to show for the potential he possesses. He has continuously let the team down in crucial situations and failed to make his presence felt at the attacking third of the pitch. Playing on the left-hand side of the attack, Sanchez has failed to pick long balls or provide crosses into the box. Sometimes he comes in too inside the box which means that left-backs Luke Shaw or Ashley Young have to make compensatory runs in the front and go immediately back to defend. Sanchez has also struggled a lot with the ball in his feet, failing to go past defenders or even give quick passes to Paul Pogba, Lukaku or Jesse Lingard. Being of average height and medium-built also means that he is not the strongest when the ball is in the air. 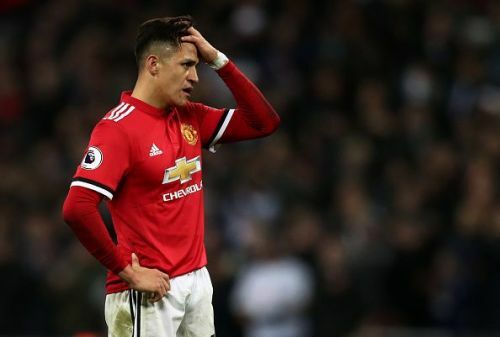 Some might say that Sanchez has not been successful because Mourinho has played him on the left wing and that he might do better if he is played as a centre-forward or as a second striker behind Lukaku. This is a very feasible option indeed and if carried out, could see the Chilean regain the confidence he has lost and return to the top of his game. Manchester United need a good crosser of the ball from the wings if they want Lukaku to create more chances and Sanchez hasn’t really been able to do that. If Mourinho is unwilling to play him at his favoured centre-forward position, then the viable option would be to drop him. Anthony Martial at left wing can provide pace, width and good crosses into the box. Juan Mata, being left-footed, can be another option. Even the versatile Lingard can play on the left wing. Sanchez had a lot of off-time before the season began to recharge his batteries and everyone at Manchester United thought that he would arrive with menace in his armoury. Alas, that has not been the case in this season yet. He has looked like a fish out of the water after arriving from Arsenal in January and perhaps the time has come for Jose Mourinho to give Martial and Mata a go. Sanchez played as the lone striker in United’s pre-season tour of the USA in the absence of Lukaku and Marcus Rashford and impressed mightily. Maybe it is time for Mourinho and assistant Michael Carrick to see where Sanchez can best fit in. Getting the best out of this immensely talented player is vital to Manchester United’s title hopes this year.